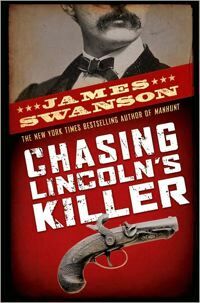 Chasing Lincoln's Killer by James L. Swanson, is a young adult version of his book Manhunt. It's a non-fiction book about the 12 day hunt for Abraham Lincoln's killer, John Wilkes Booth. I found this book in the little bookstore in the Lincoln Memorial, I was just looking around the store and BAM there it was. At first I thought it was just some dumb (excuse all of my followers who like these books) books where some kid travels back in time and helps "change history". This book is actually a real, honest to goodness, all facts book that seemed like it was historical fiction, not real history. I normally don't like history books where it's just a bunch of facts listed on a piece of paper that got published and called a book. But, Chasing Lincoln's Killer isn't just a bunch of facts it's actually an interesting story to read. I think that if you are interested in Lincoln's political life this book doesn't really portray his political life, it tells the story of him being assassinated and the scheme that John Wilkes Booth used for killing Lincoln and getting away with it. I think the most interesting thing I learned is that John Wilkes Booth wasn't working alone, he and two of his friends went out to kill other people, too. He sent someone to kill the Vice President and another person to kill Seward. The reason why I think we don't really know about the other two is because the person who went to kill the Vice President got drunk (I think that is the only time that drunkenness is okay) right before he was going to kill him so he didn't. Also the person who was trying to kill Seward only severely injured him. I think my favorite (Well, if it weren't in real life) thing is that Booth shot Lincoln during a "laugh line" so some of the people in the theater didn't know that Lincoln was murdered. A lot of people though it was all just part of the show. I think that if you are a person that likes fantasy or just general fiction, you will like this book because it's told from a point of view of a fiction book. What a great review. I want to read this book now. I had no idea about the other attempts! Great job, maggie! Yeah, the other attempts were really a surprise to me, at first the press thought that Seward was dead, so the wrong idea got out to all the people. I am reading this book for summer reading and I think this review really gave me the push I needed to actually go out and get it. Thanks ! I read this a couple of year's ago and really enjoyed it also. I found it fascinating to hear the inside view of what went on, and I passed the book along to my son's 5th grade teacher when I finished it. It was an awesome story. My 10 year old brought it home from school and I ended up reading it myself - he never did (his loss, I suppose!). The book was so interesting. I never realized that there was so much to the story of Lincoln's murder. I never realized there was so much planning and backstory to this assassination. I kick myself now for not paying more attention or learning more American history. If there were more books like this, I'd be a history wiz! In fact, I've been searching for more...if you have any suggestions. For some reason I cannot comment on here with my Google profile so I'll post "anonymously." I don't know how old you are (and as a parent you shouldn't post it publicly on the internet) but your blog is incredible. Your reviews, everything. Good job! Wow!! This is a really great review! I used this book for my big essay due tommrow and it this review helped me and I thought it was a really good book!